Have you ever been in a love relationship and completely lost your sense of self? If so, you’ll want to read on and find out more about the central chakra nexus in your body that can help you give equal importance to loving yourself and loving others. And you may also want to scroll down to find the two contrasting meditations that can help you to balance your heart and solar plexus chakras when done regularly. But before we talk about your most important chakra nexus, I should probably explain what a chakra nexus is. You have six embodied chakras (and one above your crown). 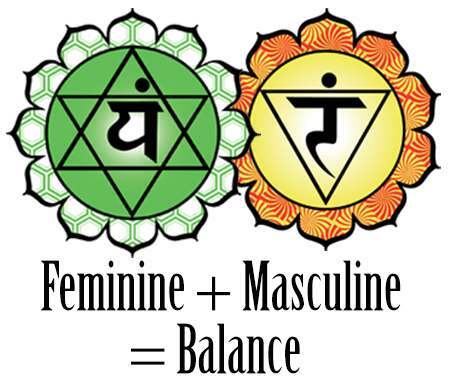 Your six embodied chakras pulsate between masculine and feminine energy, with your root, solar plexus and throat chakra being masculine and your sacral, heart and brow chakras being feminine. Your chakra nexuses are the points in your body where your polarized, adjacent chakras meet. This means you have five chakra nexuses in your body between your 1st and 2nd chakras, 2nd and 3rd chakras, 3rd and 4th chakras, 4th and 5th chakras, and 5th and 6th chakras. Each one of these points represents a key spot in your body where your masculine (contractive, externally-oriented) and feminine (expansive, internally-oriented) energies meet, so they are very important for chakra balancing. Quite interestingly, the three main chakra nexuses (between 1 and 2, 3 and 4, and 5 and 6) also happen to be the three focal points of Anusara yoga. A focal point in yoga is a place from which prana moves in and out. All yoga poses have one of the three main chakra nexuses as their focal point. (You can read a little more about focal points here). Balance is key when working with the chakras and alignment, so the 3rd focal point that resides at the bottom of the heart is the arguably most important. It resides in the very center of your physical being between your heart and solar plexus and it’s the balance point that allows you to take care of yourself and others, without making one more important than the other. When you are able to be equally strong in BOTH your solar plexus and heart chakras, you are able to love and take care of others without sacrificing yourself, and you can be “in love” and not lose your identity or your power. You can also experience romantic preferential love (loving one individual because of who they are) while unconditionally loving them too. You can accept what is in any moment, and also transform it in to something even better, and you are able to be simultaneously humble and confident. Here are two great meditations you can watch to balance this key nexus point. Once you’ve done both, then wash, rinse, and repeat, because repetition is what makes energy practices stick and turn into your new normal. May you balance your “bottom of the heart” chakra nexus so you can feel powerful and loving. Vicki Howie is an Empath, Life Coach, and Creator of Chakra Boosters Healing Tattoos™. Vicki’s a Certified Master Hypnotherapist, NLP Practitioner, and Registered Yoga Teacher who can help you tap into your personal roadmap for success – your chakras. Grab your FREE copy of her Chakra Empowerment Course or a FREE copy of her Heart Chakra Healing Song or find out more about her Chakra Boosters Healing Tattoos™ here.You can also get her new book “The Key to the Chakras” here. Love and blessings. GREAT article, Vicki. I am always learning something from your articles! Who knew (other than you).. And now that I am finally back to a regular yoga practice, I will get into those anusara points! Thanks!